Tahmasbi, S., Heidarpour, M., Moghaddam jafari, A., Kazemi Mehrjerdi, H. (2013). Effects of Pomegranate Seed Oil on Oxidative Stress Parameters and Lipid Profiles in Ovariectomized Rats. Iranian Journal of Veterinary Surgery, 08(2), 17-24. Saeedeh Tahmasbi; Mohammad Heidarpour; Amir Moghaddam jafari; Hossein Kazemi Mehrjerdi. "Effects of Pomegranate Seed Oil on Oxidative Stress Parameters and Lipid Profiles in Ovariectomized Rats". 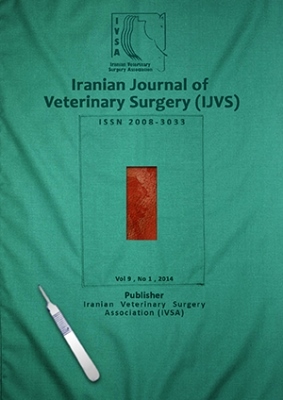 Iranian Journal of Veterinary Surgery, 08, 2, 2013, 17-24. Tahmasbi, S., Heidarpour, M., Moghaddam jafari, A., Kazemi Mehrjerdi, H. (2013). 'Effects of Pomegranate Seed Oil on Oxidative Stress Parameters and Lipid Profiles in Ovariectomized Rats', Iranian Journal of Veterinary Surgery, 08(2), pp. 17-24. Tahmasbi, S., Heidarpour, M., Moghaddam jafari, A., Kazemi Mehrjerdi, H. Effects of Pomegranate Seed Oil on Oxidative Stress Parameters and Lipid Profiles in Ovariectomized Rats. Iranian Journal of Veterinary Surgery, 2013; 08(2): 17-24. 1Department of Clinical Sciences, School of Veterinary Medicine, Ferdowsi University of Mashhad, Mashhad, Iran. 2Department of Basic Sciences, School of Veterinary Medicine, Ferdowsi University of Mashhad, Mashhad, Iran. Objective- This study was designed to determine the effect of pomegranate seed oil (PSO) treatment on oxidative stress and lipid profiles in ovariectomized (OVX) rats. Design- Experimental study Animals- 24 female Wistar rats Procedures-The rats were randomly divided into four groups: sham-operated (SHAM), SHAM with PSO treatment (SHAM + PSO), ovariectomized (OVX), and ovariectomized with PSO treatment (OVX + PSO). OVX and SHAM rats were treated with PSO (200 mg/kg/d) or normal saline solution (in a volume similar to PSO), orally using a stomach tube for 8 weeks. Results- Although a significant decrease (p < 0.01) in serum total antioxidant status (TAS) concentration in the OVX group was observed when compared to the SHAM group, no significant difference was observed for TAS between OVX + PSO and SHAM groups. Rats of the OVX group presented a significant increase in LDL cholesterol concentration (p < 0.05), when compared to SHAM + PSO group. However, no significant difference was seen for LDL cholesterol between OVX + PSO and SHAM + PSO groups. No significant differences were seen for superoxide dismutase, glutathione peroxidase, malondialdehyde, triglyceride, total cholesterol and HDL cholesterol between groups. Conclusions and Clinical Relevance- The results of the present study showed that PSO might have some beneficial effects on the antioxidant status and LDL concentration after ovariectomy in rats.